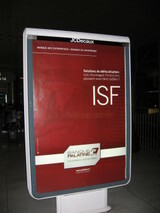 Impôt de solidarité sur la fortune ISF (pronounced E-S-F). The Fortune Tax. It's enough to send shivers down your spine. At least if you are one of the people who has to pay it. It seems to send shivers of delight down those who don't. The ISF is one of those really different peculiarities of France that you don't discover right away. I did wonder why a very rich friend of ours moved from Paris to London shortly after Mitterrand was elected. The day it became real to me, I met a poor, dignified, thin old lady in her eighties, who lived in a small apartment cluttered with the bibelots of a lifetime, overlooking the Champs de Mars and the Eiffel Tower. She had lived there since she got married as a young woman in 1937, and her husband's family had lived there since the building was built about 1915. "There were still cows on the Champs de Mars in those days," she told me. Now, the old lady was being forced from her home of more than sixty years because she could not pay the ISF. "I would like to meet that Mr Fabius!" she quavered, shaking her fist. "I would tell him what I think of him! To take my home away from me, at my age!" "What is the ISF?" I asked curiously as we descended in the creaking old elevator, barely big enough for a single person to use comfortably. "It's a tax that depends on what you own, not what your income is," said my friend. "The old lady's apartment is worth a fortune nowadays, so even though her income is less than $800 a month, she owes a percentage of the total value of the apartment to the government each year. She can't pay it, so she has to move." The ISF was originally a tax on actual possessions of only the very rich* --whom no one identifies with, of course; this explained our friend's decamping to London. In a convenient coincidence, works of art were not included in these property evaluations; Mr Fabius's family money came from an art dealership. But the updated tax is now a yearly percentage of the worldwide possessions (not income) of any permanent resident of France. It includes the sum of the value of your apartment, your garden, your art, your jewelry, your furniture, your silverware, your car. Pony up! 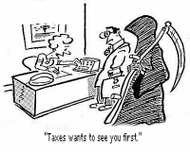 One thing no one expected when the tax was instituted was that ordinary people would be subject to it. But the relentless rise of real estate prices in Paris and other places has been cruel to people with valuable real estate, but no income, like the unfortunate old lady I met. They have to sell their homes to pay the tax. The most famous current examples are the old farmer and fisher families of the Ile de Ré, an island off the coast of La Rochelle which has become the Martha's Vineyard of France. A square meter of land there costs more than a thousand euros, and the ISF on this value is mercilessly exacted from families who have lived there for hundreds of years. Many of them have had to sell their ancient property to speculators. The French media does story after story on the plight of these people, and on those of retired doctors and lawyers in Paris whose retirement and home are in jeopardy, but the ISF remains politically untouchable. 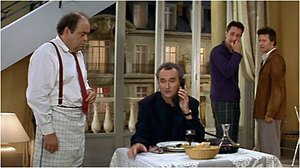 In the movie Le Dîner de cons, the arrogant main character has to ask a tax inspector to help him find his errant wife. He suddenly realizes that inviting a tax inspector over to his apartment may not be the best idea. The ISF requires taxpayers to evaluate their own possessions, and naturally he has done no such thing. He and his friend run around the apartment stuffing paintings, silver, crystal into a closet, and pour vinegar into the inspector's wine before he arrives-- the vintage is too expensive. But the inspector (played by Daniel Prévost, center, who won a Cesar for the role) is a modern Sherlock Holmes. His keen eye goes to the rectangular patches on the walls and his finger traces the dust-free places where the statues stood. "There is something pas très net here," he announces as he leaves. "I'll be back!" The result of the Fortune Tax has been a massive departure of the people the tax was aimed at. The latest famous person to leave is Johnny Hallyday, who said that he is moving to Gstaad, Switzerland because after a long lifetime of work, he finds it unfair to be able to offer no security to his heirs. "In France, I pay 70% of my income in taxes," he said. Johnny's friend, Nicolas Sarkozy, promptly said that he understood Johnny's decision; taxes in France are too high. This caused an uproar in France. I heard Yannick Noah on the radio, saying that he did "not want to judge Johnny," but that he, personally, was proud to pay his taxes in France (another day I heard him modestly admit, "Yes, it's true that I am the best-liked person in France. It's a great honor to be so well loved"). A Swiss banker interviewed just afterwards said, "In terms of taxes, it is advantageous to live in Switzerland for any French person earning 50,000 euros and upwards." This week, the socialists Ségolène Royal and her "companion" François Hollande, who famously announced, "J'aime pas les riches! [I don't like the rich!]" are in the news because of the ISF. Like almost anyone who owns a larger-than-studio-sized apartment in Paris, they are considered by the tax inspectors to be rich and subject to the "Fortune tax" themselves. *The first website that pops up on Google when you type in French "Impôt sur les grandes fortunes" [Tax on great fortunes] is that of the Communist newspaper Humanité [ motto: "In an ideal world, Humanité would not exist"]. Thanks Craig. That story makes it very clear what is wrong with the ISF. Nice paper on the ISF – well done ! A million bucks sure ain't what they used to be. Terrific piece, good on you! Read a great article in Le Figaro yesterday, who published a survey of which political figures pay and which don't, and what exactly they have in assets--I roared to discover that Segolene in her spiffy little (chanel?) suits tools around in a renault scenic and arlette laguiler drives a clio. I have to say it's probably a morally sound idea, at least in a Socialist country, to have a fortune tax, but they certainly ought to tax income and not assets, and to raise the bar on what's considered a "fortune" ("eight hundred thousands euros, hahahahahha! oh wait, how much is our flat worth?"). Would you agree that referring to assets as "patrimoine" has all sorts of interesting social implications? I never thought of that before, but yes, it does. I think no one should lose their principal residence or land that's been in their family for generations just because they can't pay a tax on "wealth." Tax on actual income, or usable wealth, is another thing entirely. The story of the old lady is meaningless, unless you know perfectly her situation and unless you have explored all the other possibilities that she had. For example, why couldn't she sell her apartment in "viager" and stay in? If you have assets there is always a way to get income from them and then to be able to pay ISF. As a result, ISF is not really a tax on the wealth, but it's rather a tax on the wealth that is invested badly, and from this point of view it could even have a positive effect on the economy by favoring the use of this wealth in good investments. I don't see anything scandalous in that. As you could have guessed I'm French... but I have lived one year in the US, one year in Italy and one year in Britain. I paid (income) taxes there too, and they weren't low.